Elizabeth Cervantes Barrón, who recently moved from San Jose to the Los Angeles area, is running for Controller. She has been endorsed by the Peace and Freedom Party State Central Committee, and party activists throughout the state gathered signatures in lieu for her so that she appeared on the June primary ballot without paying any filing fee. Her statement for the June Voter Information Guide that went to all registered voters in California was "I believe working people should control California." 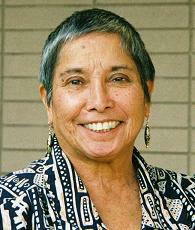 Elizabeth Cervantes Barrón was born in Los Angeles in 1938, where she graduated from Jefferson High School in 1956. Training as a teacher, she attended Van Nuys Community College from 1956 to 1958, and California State College (now University) Northridge from 1958 to 1960. She began teaching in Pacoima in Los Angeles County in 1960. In 1963 she married and moved to the San Francisco Bay Area where her husband worked. Attending San Francisco State College (now University) she obtained her credential in special education in 1964. For a year in 1965-1966 Elizabeth Cervantes Barrón and her husband lived in Delano, where he worked full-time as an organizer for the Farm Workers. As the Vietnam War heated up, she became active in opposing the war. In San Jose during the early 1970s she was the South Bay labor reporter for Pacifica radio station KPFA. Her life was as busy as could be, raising three children, active in politics, and doing labor support work. She joined the Peace and Freedom Party when it was formed to give an electoral expression to the movements for peace, justice and human rights, and soon became a member of its state central committee, as she has been for most of her life ever since. In 1974 Liz ran for Congress in the old 13th District in the South Bay, and in 1978 she was the Peace and Freedom Party's nominee for State Controller, receiving just short of 300,000 votes. In 1980 she was drafted as the Peace and Freedom Party's nominee for Vice President. Meanwhile, she went back to work as a teacher. From 1975 to 1982 she worked as a substitute teacher at the elementary level, and in 1982 she took a full-time job as a teacher with the Alum Rock Elementary School District in the eastern San Jose area. This is the job from which she retired in 2002 after 20 years. She was active in her union, the Alum Rock Educators Association (CTA-NEA), serving as a school site representative. For relaxation, Liz Barrón plays the piano and reads science fiction and action novels. She has three adult children. Elizabeth Cervantes Barrón appeared on the ballot again as the Peace and Freedom Party nominee for U.S. Senate in 1994, receiving over a quarter-million votes. With more time to campaign now that she is retired, she is running again for State Controller in 2006. As the only candidate in the June primary, she will face the nominees of five other parties in the November general election.